These small, tropical copepods exhibit a “jerky” swimming motion that elicits a healthy feeding response in many finicky fishes. SA’s Parvo Pods are pelagic (open water swimming) herbivores originally isolated from Hawaiian waters, where they consume algae from the water column. SA’s Parvo pods are smaller than SA’s Tiger Pods, making them suitable for smaller fishes and invertebrates. 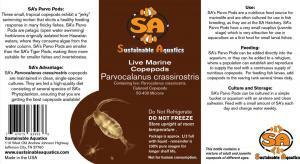 SA’s Parvocalanus crassirostris copepods are maintained in clean, single-species cultures. 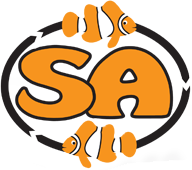 They are fed a high-quality diet consisting of several species of SA’s Phytoplankton, ensuring that you are getting the best copepods available. SA’s Parvo Pods are a nutritious food source for marinelife and are often for use in fish breeding, as they are at the SA Hatchery. 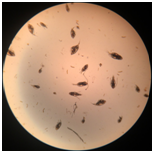 SA’s Parvo Pods have a very small nauplis (juvenile stage) which is very attractive for use in aquaculture as a first food for small larval fishes. 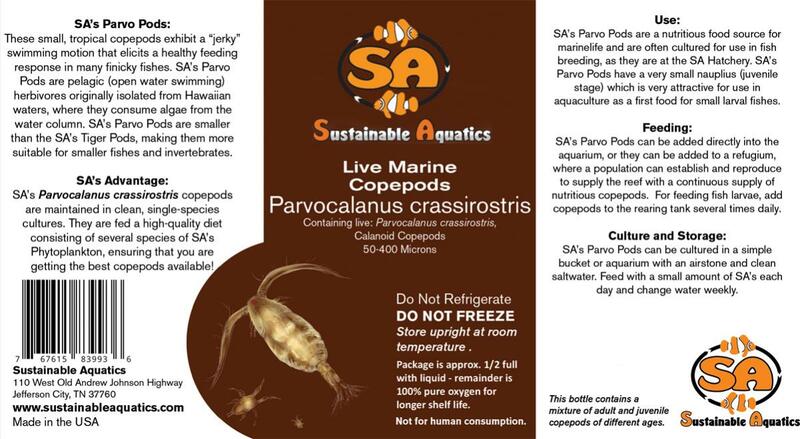 SA’s Parvo Pods can be added directly into the aquarium, or they can be added to a refugium, where a population can establish and reproduce to supply the reef with a continuous supply of nutritious copepods. 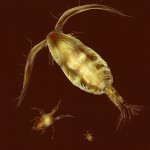 For feeding fish larvae, add copepods to the rearing tank several times daily. SA’s Parvo Pods can be cultured in a simple bucket or aquarium with an airstone and clean saltwater. Feed with a small amount of SA’s each day and change water weekly. Package is approx. 1/2 full with liquid – remainder is 100% pure oxygen for longer shelf life.